This wasn't even close. Finally some guy got up and told Bush just what kind of job he was doing. For four long years the media has been too afraid to ask the tough questions. Finally someone spoke out. It was Kerry and he floored Bush. We saw the debate at Frankie Z's. The place was packed. There were between 150-200 people. Regulars said they couldn't remember when so many people came. All the chairs were taken. Many people were standing. Several were sitting on the floor in front of the big-screen monitor. This was an event for all of us to remember. People had a good time. We raised some much needed cash for the Battleground state fund. We told people about all the events taking place here in Illinois and in Wisconsin, Iowa and Michigan. People were able to see for the first time a head-to-head confrontation between the miserable failure that is George Bush and someone who's going to be the next President of the United States. Note, this was a joint event. In addition to all the volunteers, we had almost the entire staff of the Kerry for President Campaign -- including State Director Avis LaVelle and Finance Director Helen Marieskind. We joined together to watch our guy do a truly phenomenal job. Thanks to everyone who came -- thanks also to waitstaff at Frankie Z's, Jen & Megan, as well as to Frankie himself. Wow! I'm speechless. Does anyone have an opinion on this Debate? What do you think of the build up? Is it 'make or break'? What do you think of the way it was organized? Are there too many rules? Is our guy going to show his stuff and trounce Bush? What does it all mean? If you've got an opinion, please leave your comment here! Phone banks and Canvassing Success! This week 16,000 contacts were made -- that is 6,000 more than last week. 1,000 people were met at their doors and the ratio is still 2/1 Kerry!!! Just think how many more people we can reach if we had more to help with canvassing? Phones calls are equally as important, so those who want to help, but feel that canvassing is too much, considering phone banking. Jack Ryan -- who is in charge of Travelers in MO -- has made a special plea asking for our help Oct 2. He wants to show a strong support in MO following the first debate. A huge canvass effort is going to be made. Canvass times 9:30 am and 1pm on Saturday and 12:30 pm on Sunday. When asked how things were going (since I noticed some nitwit new cast had painted MO in red) he said actually,"You should know the National Champaign is sending us 20 more staffers -- that makes about 60 staffers in the St Louis area!! Now I have to say, if MO is/was a no possible win, would the National Champaign be sending 20 more staffers! No, No way! 2 more staff offices open this week in MO making 23 staff offices now in operation in MO. To bring this home - Al Gore had a total of 9 offices in MO. Again -- Kerry has NOT given up on MO and MO has not given up on Kerry!!!! Jack also mentioned that a few weeks out in Iowa, they had Kerry down by 34 points and he won. SO ..... lets go! Jack was impressed at the number of IL volunteers that have shown up to work thus far, two weekends ago a group went to Kirkwood to help there. He said that each weekends - and for quite some time -- their interest is going to be working with the undecided voters. Another stat: Gore lost MP by 75,000 votes ( 3%) We need to up the voting numbers to 90,000 NEW voters for Kerry. With the National Champaign sending 20 new staffers they strongly believe it is possible. So do I. Note: Contact Jack Ryan for information on Illinois for Kerry Travel to Missouri. i4k had another excellent showing in Wisconsin this Saturday. 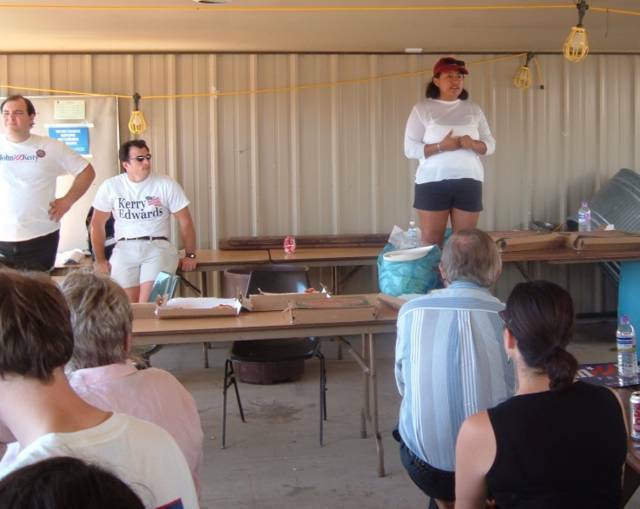 Over 140 volunteers were sent out to canvass largely democratic wards in Beloit and Madison, trying to induce Kerry supporters to vote absentee. This helps the campaign in three ways: it puts the votes of some supporters in the bank before election day (even the strongest supporters can't be counted on for 100% turnout! ), it shortens the lines at the polls and hopefully thus encourages more people to vote, and it makes our massive election day GOTV drives simpler and more effective. In 2000, it was the absentee vote that put Al Gore over the top in Iowa -- if we work hard enough, we might see the same phenomenon in Wisconsin this year! On September 25, we collected 821 absentee ballots. Can you help us make sure to pick up over 1,000 next Saturday? This work is so important to keep the pressure up on the Bush campaign. We have to continue to outwork them. The Wisconsin Team Kerry is looking to us to be their clean-up hitters and to go where the campaign has the greatest need. We have to continue to fill the buses and add more. Wisconsin will turn on who wins the ground war. Please consider answering the call and going to Wisconsin this weekend on Saturday the 25th. RSVP to the John Kerry Volunteer center or e-mail NIKerryTravelers@yahoo.com. in Lincoln Square tonight! There were about 25 in attendance and all interested and engaged. The venue, Rockwells, was a very good choice and co-host Annalisa Lunn did an amazing job of rallying her troops to attend, sign up for Outreach and other volunteer efforts and contribute funds for Wisconsin towards a bus!! We kept it pretty simple and focused on the Kerry Travelers, Frankie Z's and of course the i4k Basic flyer. We also had Clark McCain, from the letterwriting team, present to speak. The mood of the attendees was as to be expected. There is a palpable feeling that IT'S TIME to turn up the heat and make it happen. People are interested and willing to help in Wisconsin. I'm very much looking forward to the debate next week (at Frankie Z's). Last night's Kerry Meetup was good. We didn't have as big of a cut in our attendance despite the Meetup.com's website overhaul. Co-host Kathy Karsten and I hosted about 25 people, and some came up to me afterwards and said they liked the size, so maybe the turnout was for the best. As you can see, Kerry's doing well. Scott Larson has been leading the effort on the Northside and North Suburban to phone bank to two thousand John Kerry volunteers in this area. They are really getting people engaged and keeping the volunteers informed of all the opportunities out there to make a difference. Great Job Team Kerry! On Wednesday, September 22 we made 450 phone calls to different Kerry supporters in the northern suburbs from the DPOE office. We had 12 volunteers working the phones, the majority of which volunteered not only their time, but also their cell phones to the endeavor. They all did a really great job! The response was fantastic! We recruited lots of volunteers for the Wisconsin bus trip, and for swing-state phonebanking. Everybody was really excited about helping and the office buzz was unbelievable! The majority of the folks that we were calling were not home and we left messages for them. It's important that we talk to these people personally, so we will continue making calls right up to election day. If you would like to help out with JK volunteer phone banking efforts, they meet every Wednesday night in the Democratic Party of Evanston office. Please rsvp to 847-491-0865. Congresswoman Schakowsky's, Congressional District "Vote 2004" Rally was a day of inspiration for a huge crowd in attendance at the Doubletree Hotel in Skokie on Sunday, September 19. Hotel management had to keep adding more and more chairs, as the room filled to capacity to hear speeches from Senator Joe Biden of Delaware, Congresswoman Jan Schakowsky, Ninth Congressional District State Senator Jeffrey Schoenberg and State Representative Julie Hamos, and other Democratic State Leaders. Senator Biden's speech was stirring to all in the room as he described the mistakes committed by the Bush Administration. He faulted the administration for running a destructive presidential campaign, designed to destroy rather than defeat an opponent. He challenged why the Bush administration divides rather than unites people. Senator Biden, further described the irresponsibility of President Bush, who he claims squandered and damaged the reputation of the U.S. throughout the world, resulting in a major dilemma for the next President, no matter who wins election in 2004. Senator Biden continued by explaining that Senator Kerry understands the ultimate significance and pain of going to war. Especially, a war in which we did not have the United Nations consensus. Having known Senator Kerry for over 30 years, Senator Biden spoke about his strong ideology and ability to act on the strength of his convictions. He said that Senator Kerry truly is a man with an ideology. He does not just "have ideas" like President Bush. Senator Biden also emphasized that Kerry, who is a thoughtful student of history, would not just rely on the U.S.'s ability to "bully" because of its military strength. He asserted that the U.S. needs someone who will listen to input from our allies and win their support, before moving in new directions, especially when it involves going into war. You can Blog and Canvass Too! Local blogger, Cynical from Fresh Paint, is also an I4K Canvasser to Wisconsin for some fun reading check out her interesting blog from Beloit. Go Cynthia! Also, there is an interesting article in the Trib today about how important absentee ballots will be this eelction. Another great job by i4k volunteers in canvassing Milwaukee this weekend. Over 110 volunteers turned up to canvass largely democratic wards in the city in search of voters who would like to vote absentee. Volunteers also distributed window signs, buttons, literature and bumper stickers. Hundreds of applications for absentee ballots were collected and returned to a beaming Wisconsin staff. Absentee ballots help the campaign in several ways; makes sure people vote, reduces lines in the polls so we don’t lose people who get tired of waiting, and gives us less people to pick up and take to the polls on Election Day thereby making us more effective. In 2000, George Bush won the Election Day voting in Iowa. However, Al Gore won the state because of absentee ballots. Please consider answering the call and going to Wisconsin this weekend on Saturday the 25th. RSVP to the John Kerry Volunteer center at or e-mail NIKerryTravelers@yahoo.com. I ran into a reporter/columnist for the SunTimes and she recommended that I look up the "bad news" on the front page of the New York Times. She said this in reference to the latest CBS/NYT Poll which found that Dubya "has an eight-point lead among registered voters". As usual for a reporter/columnist for the SunTimes, her viewpoint lacked any context. Indeed, I hear a lot of people -- many supporting Kerry -- who look at these polls and are positively freaked out. This may not be such a bad reaction in the long run -- if it encourages Kerry supporters to do more to help the candidate. On the other hand, I think: well, what did people expect? Did people expect that Kerry would maintain a comfortable lead all the way from Boston to the general election in November? When have things gone that way in recent history? This was going to be close. We all knew that. What does 'close' mean? It means Bush may very well appear to be leading for much of the way. This was the case in 2000. Almost every poll indicated that Bush was more popular than Gore. Yet it turns out, as we all know, that Gore actually won the popular vote. So much for polls. To make matters worse, there's the filter the Media applies to our candidate which is rarely favorable. What they report -- including these polls -- is chronically slanted to the current incumbent. When Bush leads by 5 percent, it's "Bush Widens Lead"; When Kerry leads by 5 percent, it's "Election Still Too Close to Call". So what else is new? We're got a challenging environment where we nonetheless have to push our candidate over the top. The polls overestimate the number of Republicans who are going to vote and underestimate the number of Democrats. For a great analysis of this bias see Donkey Rising or MyDD. Far more than polls, what we need is a little perspective. We don't need many more people than what we had in 2000. So what do we have? People who went for Gore in 2000 aren't likely to go for Bush in 2004 -- based on Bush's spectacular record of failure in the past 4 years. So we've got those. Then, based again on this record, when we look around, we've got those and then some. It's only natural. And that's all the difference. I returned, for 4 days, to Davenport for the first time since Kerry's build up to the caucus. I was certified as an Absentee Ballot Courier. This is as part of the Iowa Dem. Parties GOTV initiative to get Dems that have not voted in all the past elections to vote. As the couriers collect absentee ballots, those voters will be marked off the absentee ballot voters list and anyone left the last week before the election will be contacted to get their absentee ballot sent in or picked up by our courier. The voters in Iowa have the same concerns as anyone else, including that lack of unbiased substantive Media coverage. There are a higher percentage of gun militants for Bush there. It was great to return to Mary Sue's Cafe where Kerry held a round table luncheon discussion about jobs before the caucus. Mary Sue waits on every table herself and is an avid Kerry supporter/Bush hater. There is a dedicated group of Western Ill. Univ. students that help out every evening and weekend with canvassing. This last trip, in addition to the courier training, I did office work, phone banking to get Dems to vote absentee and polling (Kerry is up in the Davenport area) as well as data entry. This next trip I'll be bringing more yard signs and buttons and will stay with an older couple who are great Kerry supporters. Thank you for being a part of the Road Trip to Victory program! Your help is critical to win this election. On September 12th Wisconsin welcomed 130 Illinois citizens in our towns and cities to further help our efforts to take back the White House. We thank you for your time and commitment and invite you to rejoin us in the future, whether its for a day, a weekend or a week, all your help is appreciated. John Kerry and John Edwards want to make us stronger in America and respected in the world, but they can only do that with your help. Al Gore won Wisconsin by only 5,000 votes in 2000 and polls suggest the Presidential election may be even closer this time around. Republicans have targeted Wisconsin with millions of dollars in negative TV and Radio ads already and will stop at nothing to take the election. Wisconsin, which has 11 electoral votes, will be critical to John Kerry’s chances of garnering the 271 electoral votes he needs to be elected President. As you can see, Wisconsin is among the three or four most hotly contested swing states, and John Kerry needs your help to win here and participation will help determine the outcome of this election. By traveling here to volunteer your time and energy, you are making an invaluable contribution to our victory on November 2nd. John Kerry, John Edwards, Chairman McAuliffe, and the entire Democratic ticket thank you and appreciate everything you are doing for this campaign. Your unique ability to speak directly to voters through various methods of voter contact including going door-to-door and making phone calls is the only way we can win!!! House Parties for Wisconsin Needed! This election is, likely, the most important presidential race we will see in our lifetime! Wisconsin is a critical state for John Kerry to win - those 10 electoral votes could turn the tide in this election! On Sunday, Sept 12, Chicagoland for Kerry sent two buses and a caravan of cars to Wisconsin. We hit the ground running in Janesville, Beloit and Milwaukee. We canvassed hundreds of Wisconsin voters and gave the Democratic Party of Wisconsin a fresh boost of energy for the home stretch! Those buses were flying, powered by the spirit and enthusiasm of the 150 volunteers who went! By the way, it takes a good deal of money, as well! There are a million worthy causes crying for our attention and for our money right now but we've got to stay focused on our priorities! We must win Wisconsin! Right now, we are in a strong position for Kerry to win Illinois. Team Kerry Wisconsin is in a dogfight - they've asked for our help and we are compelled to give it to them! Jan Schakowsky was able to fund one of the buses last weekend and the rest of the money came from house parties, given by our wonderful volunteer hosts. Each bus costs a minimum of $500 a day - as we reach farther north, there will be overnights and significant additional expenses. A House Party to benefit the Democratic Party of Wisconsin/Chicagoland for Kerry Unity fund is the single most effective way to raise money and to recruit new volunteers. House Parties are fun and they're easy! Set a date and time, and invite everyone you ever met! We'll provide sample invitations, ideas, and hand-holding if you need it! We have buttons and bumper stickers and we'll send a speaker if you want! If you have 5 guests or 500, pick a date and email Sharon Sikes, sharonsikes@yahoo.com. Sharon's coordinating the parties for the DPW Unity Fund - she'll make sure you have everything you need to raise money and to experience that incredible energy that comes when friends come together in a common cause. Now is a critical time to step forward and put John Kerry and John Edwards where they belong - in The White House! Wendy Abrams, one of the ChicagolandforKerry volunteers who canvassed Wisconsin, found out why cavassing is so important and writes to tell others to pass it on. If you ever asked "What can I do? Does it really make a difference?" I firmly believe the ONLY way to win an election is for people at the grassroots level to get involved, get out there and talk to people on a personal basis. Yesterday, I spent the day in Wisconsin canvassing for Kerry. Among the people I spoke with was a 62 year old "undecided" vet, who was against the war and deeply troubled by the deficit. As our conversation progressed, it was clear to me that he was at odds with Bush on almost every issue. So I told him how important it is that he is in the "definitely Kerry" camp, and if he has any issues he's unconvinced about he should contact me; and I gave him my email address. When I returned home several hours later, I got a long email from him, which started by his thanking me and saying while he had several Republican mailings and Republican polls asking his opinion, I was the first person from the Democratic party to contact him. It was if he didn't consider himself a "Democrat" because he hadn't been personally "invited to the party". I'm mentioning this because it completely changed my perspective on canvassing and phone-banking. While I thought it was important from the campaign perspective, I must admit, I felt a bit hesitant to be imposing on people's free time at home. What I found from this man was that there are many people out there who are not only willing to talk- they are eager to have the opportunity to express their views and feel that they are being heard. They want to be acknowledged by the Democratic party. They need a personal connection. Seasoned Volunteers together with Campaign staff led by State Director, Avis LaVelle, fanned out across the State of Illinois on both Saturday and Sunday, Sept. 11-12. The goal was to rev up activities in Springfield, Rockford, Rock Island, East Metro, Peoria and Champaign. The meetings resembled Meetups with break-out sessions on house parties, voter registration, phone-banking and travelling to battleground States. In many places, these activities were already well underway. This gave the visitors much encouragement. Even in places where things were just getting started, people were determined to do all they could to make sure that John Kerry gets elected. John Kerry Visibility Day. Friday, September 10, eighty volunteers fanned out to over fifty CTA and Metra train stations all across Chicagoland and greeted early morning commuters. We showed our support for John Kerry by passing out stickers and "how to get involved" flyers and signed-up new volunteers to help with the campaign. Overall, the response was great and it was a fun, positive event. Special kudos to those that worked the traditionally Republican areas and to those that endured grumpy or hot-headed Bush supporters. Thanks so much to Peter for spearheading this important effort. What a great showing of letting folks know we aren't taking this state for granted. Thanks to all the volunteers worked the Islamic Society of North America convention in Rosemont Sunday. The response from the community was overwhelming as hundreds of "Muslim for Kerry" buttons were handed out and gladly displayed. Between the buttons and stickers given out over 25% of the crowd was wearing the Kerry blue resulting in a fantastic display of visibility. A stroll through the parking lot showed how many "out of town" convention goers where from battleground states. After Illinois, a significant minority of the cars was from the battleground states of Wisconsin and Michigan. The convention even made national news as the Republican's brought in a life-size cutout of Bush that was not warmly received. These same Republicans used their typical voter suppression tactics by trying to smear Kerry by handing out pins saying John Kerry "wrote the Patriotic Act" and other lies. Fortunately, most people came over to the Kerry booth to get the truth. Congratulations and thanks to Asim Mohammad, who was a one-man show! 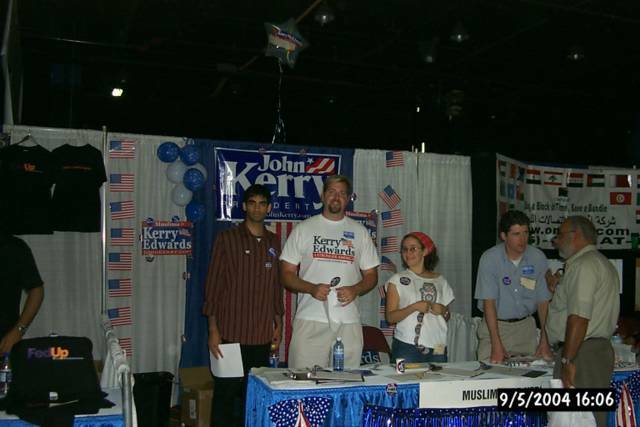 For those who don't know Asim, he has been one of the main organizers for Kerry in DuPage County since before the primaries. Asim tirelessly organized the event this weekend, got the booth, got the attention of the national campaign and pulled together the resources needed to reach out to this important community. It is conceivable the Muslim vote could not only hand John Kerry, Michigan, but also Florida. Speaking in a heartfelt manner to a crowd of at least 106 people (although, there could have been a few who slipped in without signing up!) that gathered at the Firehouse Grill in Evanston on Thursday night, for a "Kerry Solidarity Night," State Senator Jeffrey Schoenberg delivered an optimistic talk to the crowd regarding the importance of the upcoming election and the importance of Democrats' reclaiming, not only the Presidency, but also Congress. Kerry Solidarity Night, was an effort to bring our volunteers together to watch in "solidarity" the last night of the convention, as we listened to the Republicans anoint their war president and continue to wrongly link the war in Iraq to the war on terrorism. At 9 p.m., everyone watched one of two televisions tuned to C-Span and silence fell over the room. People wanted to hear what President Bush was going to say. Then, the quips and wisecracks began. Whenever a false or misleading statement was heard, someone in the room would retort with an uproariously snappy comment. Luckily, the TVs were set for the hearing impaired, so if you couldn't hear the volume over the laughter, you could still read what was being said. This pretty well describes the reception President Bush’s speech received at the Firehouse Grill. After speaking for nearly 70 minutes, many of us began complaining that it felt as if our faces were about to fall off from all of the laughing. Watching this type of Convention with like-minded people, needless to say, is highly recommended. Earlier in the evening, Daniel Dennison also presented additional information about volunteering to travel to Wisconsin and explained to the crowd that during the remaining weeks of this campaign, we must all dig deep to find the energy that we started with, and then some. 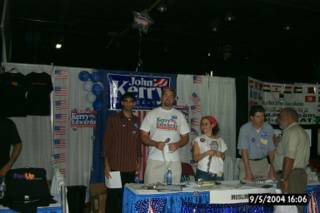 This event attracted some first-time visitors, people signing up to go to Wisconsin and additional people joining our Illinois Ninth Congressional District Volunteer Kerry Media Corps. It was a great night for building committed workers for our Party's upcoming efforts! Was it just me or did the Bush speech just seem to go on and on? This was supposed to be the centerpiece of the whole 3-day hateathon? This? And all the attacks on Kerry -- what's that supposed to be about? After bankrupting the country, ruining the military, destroying our reputation with the rest of the world, Bush & Co. are certainly in no position to lecture Kerry on anything. You all saw the anger and distortion of the Republican Convention. For the past week, they attacked my patriotism and my fitness to serve as Commander-in-chief. Well, here's my answer. I will not have my commitment to defend this country questioned by those who refused to serve when they could have and by those who have misled the nation into Iraq. I say it's time we gave the Republicans a licking like they've never seen. Read the rest of Kerry's speech.